Mhumhi found, once again, that the demands of his stomach could quickly supersede the concerns of his mind. The eggs were the best food available in the dump, so he shut his eyes and bit down hard on each one, clamping away whatever life was inside of them. He wondered if what it meant was that he did not really care, about those lives he was taking- that he was protesting for appearance’s sake. It was not the first time he had had such a thought, and it was disquieting. But, as Kutta pointed out, they had a bigger issue. “And water,” Mhumhi reminded her, though their thirst had been somewhat abated by the eggs. “Yes,” agreed Kutta, then suddenly retched, her stomach sucking upwards as she dry-heaved. “How do they do it?” asked Mhumhi, indicating the screamers with his nose. They were still hovering in the background, eyes hopeful, but they had not gotten any more eggs. “No,” said Mhumhi. Of that he was fairly certain. He recalled the image of Maha biting through the baby rat. They found another nest- the parents flying in high circles above them, crying sadly- and took the eggs carefully in their teeth. Mhumhi found he had to concentrate on keeping his jaws rigidly still for each step to avoid smashing his. They made their way back near the tunnel exit, and found Tareq resuming his activity from the day before- collecting phones. Though he seemed to have gotten slightly distracted at times, as Mhumhi could see miscellaneous other objects had found their way into his horde. Kutta turned an eat back towards him in acknowledgement and trotted over the hill. “What’s that?” asked Tareq, pointing at the eggs. Tareq picked up the nearest egg, smearing dirt on the surface of the shell with his dirty fingers, and squeezed it, furrowing his brow in concentration. The egg shattered in Tareq’s fist, making him flinch as yolk hit his cheek. As he opened his hand Mhumhi saw something pink and amorphous sliding around in the goo on his palm. Tareq put his hand to his mouth and licked it, sucking on his fingers. “Be more careful,” Mhumhi stressed, rolling the second egg towards him with his nose. Tareq smiled and picked it up with two sticky fingers. While he sloppily finished the egg, Mhumhi took a peek over the hill into the little depression where they had left Mini on the blankets. The little dog was still there, and so was Kutta, lying down next to her cushion. “Lying down,” said Kutta, without raising her head. 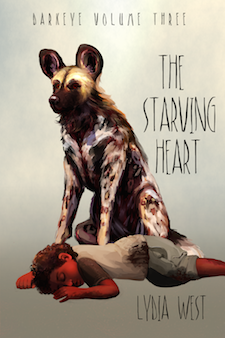 Mhumhi went over to her, his tail wagging low, and licked between her ears. She sighed. “Didn’t find any water, did you?” asked Mini, from the cushion. He fell silent. Mini continued. “Why are you only asking him?” Kutta rolled her head to one side so she could glare up at Mini with one eye. “The dispensaries are running out,” said Kutta. “I don’t think so,” Mhumhi said, his heart sinking. She blinked thoughtfully up at the blue sky. “So you’re saying that we’ll starve anywhere we go,” Mhumhi said, flatly. “If we find out where that small cow came from…” said Kutta, trailing off. The breeze blew the scent of salt and garbage at them, as if to remind them what a hopeless prospect that was. “We should have stayed at the safe place,” Mhumhi said. His heart felt sour. “Don’t say that,” Mhumhi snapped. Mini widened her eyes at them. “Don’t say the world needs fewer dogs,” said Mhumhi. Mini blinked and tilted her head. He went on hastily. Kutta gave a soft snort from the ground. He went back out and searched for the rest of the day, bringing them back what he could. He could not find any more eggs, but he did finally find some water: a foul pool of it, filthy and covered with floating trash. The screamers were going down to it and drinking from their cupped hands. Mhumhi’s already-unsettled stomach churned at the sight, but water was water. He splashed in a little ways and lapped at it, cringing. It did not taste as bad as it looked. Now he only had to get Mini, Kutta, and Tareq down here somehow. An empty plastic milk jug drifted past his nose and without thinking he snapped at it and caught it by the handle. The opening dipped below the waterline and he heard the murky stuff go pouring in. Maha had carried water, Mhumhi recalled, and he gripped the jug more firmly by the handle so he could carry it sideways, splashing water out with every step, back to his companions. That and the few other scraps that he could scrounge up were all that Mhumhi could give them, and in his frustration he lost patience and growled and chased the screamers as the sun set, scattering them away, some even with their hands still outstretched. “Waste of energy,” Mini commented, from her pillow. Mhumhi looked at her, panting, and was further reminded that Vimbo had not returned. He stalked back over to them. In the morning she was vomiting black slime. Mhumhi could only stand and watch her helplessly. She had staggered downwind of their little camp and begun vomiting before the sun rose, and it had risen and she was still vomiting, coupled with evil-smelling fluid that stained her flanks as she shuddered and squatted. He looked at her, prone on her stinking cushion, and moved closer. “The water’s probably what made her sick in the first place,” Mhumhi whispered back. “If she loses too much, she’ll die,” said Mini. In the ensuing silence, Tareq, curled up on the ragged blanket, let out a hoarse sob. Tareq gave another sob, shuddering. His hands were on his stomach, and with a violent convulsion he raised his head and vomited. Mhumhi jumped back, and Mini gave a shrill yap. Tareq was still crying, lying in his filth. Mhumhi took him by the back of his shirt and dragged him a little further back, to try and afford him some comfort. “I’ll start getting water,” he said. It was the only thing he could do. He took the milk jug back to the vile pool, and filled it as much as he could, ran it back to the camp. Then an empty plastic bottle, dragging it by the neck, then a wine bottle, then two small soda cans, and more… Every container that he could find, he filled with liquid. Mini directed him to drag out a styrofoam bowl and put the water in that, as needed, instead of pouring the containers directly into their mouths and wasting much of the water. Kutta recoiled when she saw how filthy it was, swirling in the white bowl. “Drink it,” Mhumhi said. His neck and teeth ached from carrying so much. She drank, but it did not seem to matter; she was vomiting it up anyway, or shitting it out- Mhumhi did not understand what could be left inside of her. Tareq was a mess, too, unable to move, so that Mhumhi kept having to drag him back and back, but he would need new pants if he survived this. Mini was panting on her cushion, giving orders but otherwise not much help. Mhumhi could see the fear in her eyes, and it frightened him. Was this it? Was this the end, in the garbage? “Mhumhi-” Mini called, but he was springing away, tail under his belly. He ran far, stumbling and slipping over the garbage, scattering birds and screamers, which turned their equally empty eyes on him. He met the edge of the saltwater and ran parallel to it, heart pounding, stomach rolling with each step. He began to call, gutturally. It was more instinct than anything else; deep hoo-barks, as if there were someone out there who would come to help. The birds swirled overhead, adding their lonesome cries. In desperation he turned and stepped into the saltwater, floundering up to his flanks and bumping floating trash, to lap at it. It was vile. He spat it out at once. The scent of coppery blood drifted to his nose. He turned around, splashing, sending bottles swirling. There was a definite blood smell, and it was not coming from far away. It was not that fresh. He bounded out of the water, shook himself, headed towards the smell. There were birds circling overhead, calling, crying out; a vortex of white. Mhumhi passed them on the ground, hopping, their black eyes sharp. He came upon the corpse: a screamer, stretched out with its throat a red maw. Birds were pecking at the toes and fingers. Mhumhi swallowed bile. It smelled as though it had died a few hours ago, and- and someone had definitely been eating it, someone besides the birds, because its stomach was gaping open, white ribs exposed. Mhumhi also did not have to ponder the identity of the killer, because on the other side of the corpse a great gray form stretched and rose, and stepped over it to stare at him with black eyes. Vimbo.